4 Bedroom Flat For Sale in London for Asking Price £1,150,000. 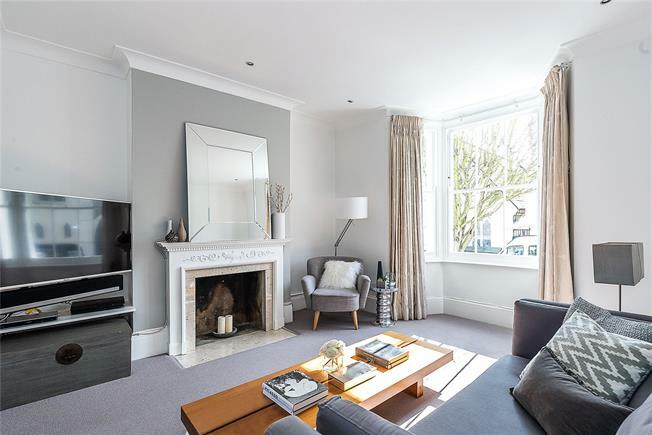 Set within a handsome Victorian building, this beautifully presented, four bedroom, three bathroom maisonette offers 1579 sqft of accommodation across three floors. Upon entering the property is a hallway, leading through to various rooms. There is a spacious double reception room, with wonderfully high ceilings, a bay window to the front and sash window to the rear allowing for lots of light and a fireplace. There are also two large storage cupboards in this room. The kitchen is beautifully finished and of excellent quality with ample worktop and storage space as well as built in appliances. At the end of the kitchen is a dining area, which leads out onto the enclosed and very private rear garden which offers ideal space for entertaining. The garden has a patio and lawned area as well as built in seating. It is not overlooked at all from the rear. On the first floor, there is a bedroom to the rear which overlooks the garden and has a small storage cupboard. There is another bedroom which is a double size with built in cupboard space. The third bedroom is a brilliant size, with ample built in wardrobe space and an en suite shower room. In addition to the bedrooms is a family sized shower room. The second floor is home to another large double bedroom with Juliette balcony, a dressing area and large en suite bath/shower room. Throughout, the property is in immaculate condition. The current owners have taken great care to retain the character whilst maximising on the feeling of light and space throughout. A further benefit of this property is that it is being sold with the freehold and offered to the market with no onward chain. Mallinson Road is situated off Northcote Road in the highly sought-after 'between the Commons' area of Battersea. It is within easy reach of Clapham Junction mainline station (0.78 miles) which offers fast and convenient access into Waterloo and Victoria (every 2 minutes during peak times). The outstanding primary schools Honeywell and Belleville are within walking distance, as well as Thomas's Parkgate, and Eaton House. This property is located moments from Wandsworth Common and Clapham Common is a short walk away. Nearby Battersea Park is also within walking distance or a short bus ride away. All the bars, boutique shops and restaurants on Northcote Road that make the area so popular are moments away.